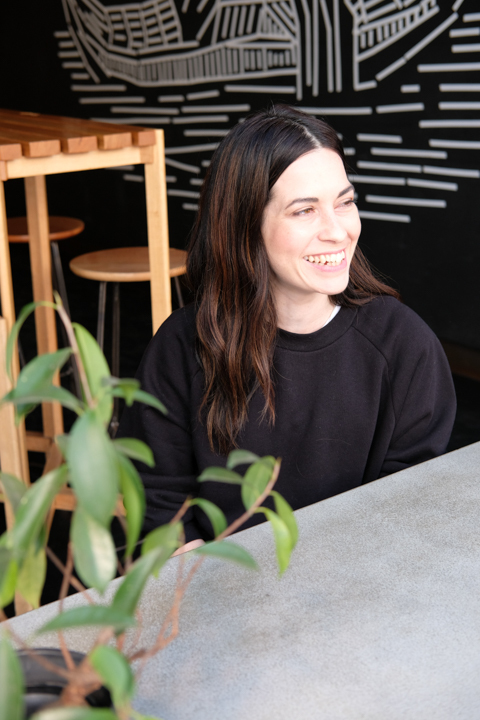 CityMag meets with Rebecca Kammer, the mind behind minimalistic jewellery brand, Base Born, at Abbots & Kinney on Pirie Street on a Monday morning – her sole day off for the week. “I work for an online clothing store called Impulse Boutique and I take their product shots and edit those photos and do all the graphic design for their EDM [email marketing]. I was there for about seven years and I left briefly to go and work with my sister [Janie] who owns Karma and Crow on Richmond Road,” Rebecca says. See more of Base Born at their website and Etsy page. You can also follow the brand on Instagram and Facebook. Creativity must come naturally to the Kammer family; through Karma and Crow (and soon Plume), Janie has shown her aptitude for venue concept and design, and her other sister, Ellie Kammer, is an established and influential contemporary artist. Rebecca, too, has a visual arts background, holding a degree from the Adelaide College of the Arts, where she was first introduced to jewellery making. “I had intended to go there for photography but I really enjoyed the jewellery making when they sort of forced us to do it,” she laughs. Though she speaks fondly of working with family at Karma and Crow, Rebecca began to miss her creative outlet and so took the opportunity to work at Impulse part-time while focussing on building Base Born. “I kind of just, on a whim, decided I wanted to go back and study a bit more jewellery-making,” She says. Rebecca has set up a home studio in Bridgewater, where she makes everything by hand. “I make every single piece on my own. I solder things on my stovetop with a butane torch. It’s a tiny, little operation. Every order that comes through makes me happy and makes me smile,” she says. Rebecca’s designs emanate a timeless class and broad appeal that CityMag can imagine working equally well as a gift for your grandmother or your moody teenaged niece. “I’m not trying to be quirky. There’s not really a point of difference. It’s just beautiful, minimal, elegant designs,” Rebecca says. Rebecca’s practice has proven addictive; she describes sitting at home on the couch with her two dogs, bingeing Netflix, and slowly crafting twenty-or-so pairs of earrings. “Because it’s quite time-consuming and detailed and you really have to focus in, you don’t really think about much else. It’s quite meditative. You’re just focused on doing a good job, basically making a beautiful thing and not worrying about life,” she says. Key to Base Born’s aesthetic is ensuring the pieces are simple enough to pair with anything, but Rebecca also stresses the importance of sustainability to her brand. “I really want all of us to have a future on this planet. I’m not quite old enough yet that it doesn’t quite matter to me anymore,” she laughs. Building Base Born on a foundation of sustainability has impacted how and where Rebecca sources her materials. 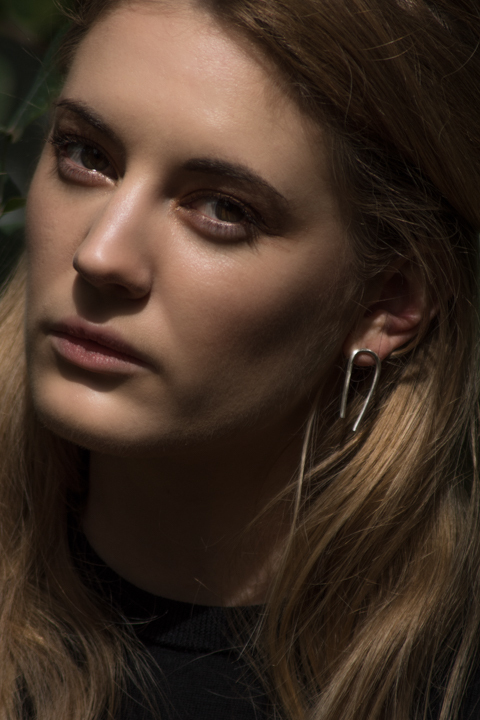 She imports all her silver from a supplier in Sydney who specialises in recycled silver, and she repurposes metals and other materials where she can. 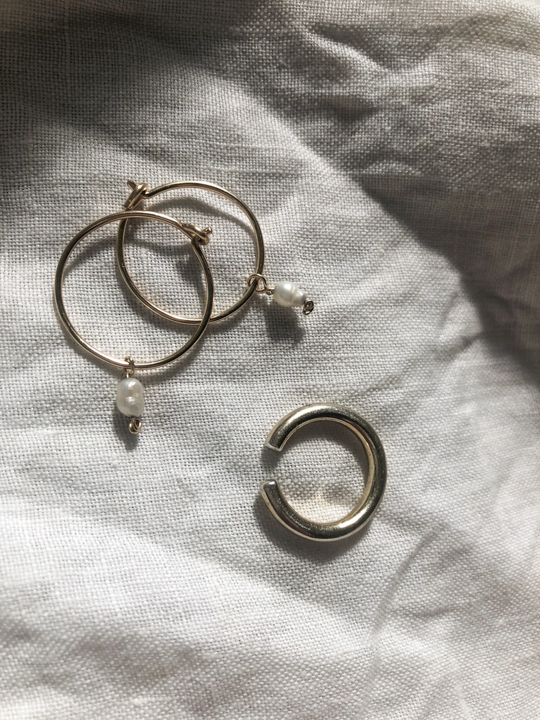 “The pearls that I use in my collections are all thrifted. I go and do little op-shop runs and pick up strands there. I always test that they’re real,” she jokes. As we wrap up our chat, Rebecca tells CityMag she’s not usually good at talking about herself so much. She is a humble creator but obviously grateful to be doing what she does, and her passion for her craft is obvious – to us, and to her customers. “Because they know that it’s handmade and there’s one person on the other end, they tend to write me little notes and it feels like I’m making it for someone that I really care about and that I want to do a great job for. It’s definitely rewarding,” she says. Rebecca is currently selling her products on Base Born’s website, on Etsy and at Karma and Crow; however, she is now looking at expanding to more local stockists, exploring market stalls and dipping her toe into bridal jewellery and hair accessories.